Next WE PRESS VINYL TOO! 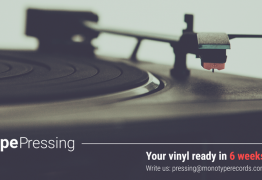 Monotype Pressing offers a wide range of pressing services for all types and formats of digital media: Audio CD, CD Data, mini CD, DVD-5, DVD-9 and professional offset print, digital-offset print, silk-screen print, CD packaging e.g. digipacks (including multi-panels), cardboard envelopes, ecopacks and many others. We also accept special orders from our clients. We offer a wide range of refined printing: matt foil, glossy foil, UV varnish, hotstamping and others. We’ve been producing CDs and printing packages for numerous European recording labels since 2005.